I wanted to see a reed in motion. To that end I made a hole at the bottom of a plastic bottle and I introduced a bassoon reed through it. I sealed the hole around the bottom of the reed to avoid leaking and blew in the bottle. I saw the reed vibrating and I saw that what actually vibrates in a reed is the very tip. The vibrating corpus of the wood winds, e.g. an oboe, is actually the tip of the reed. If an oboe could be compared to a violin, the tip of the reed would be the strings. The rest of the reed (+ staple) would be the bridge, carrying the mechanical waves produced by the vibration of the tip of the reed all the way through the cane and the staple until reaching the oboe, its very substance. In the nowadays maybe most common baroque oboe reed–staple setting in Europe, with two staples, those mechanical waves must cross 5 surfaces before they reach the body of the instrument: cane – to metal – to thread – to metal – to a whole lot of threads – to wood. I leave the theory of the vibration of a reed putting in motion the air inside of the instrument as the origin of its sound for the traditional acousticians. That theory says little about the shape and materials of an instrument, and we know how important shapes and materials are. Thinking of those waves travelling from the tip of the reed all along the cane until getting refracted into the staple, it gets clear to me how important are the density of the cane, the thickness of the blades, their form, and how smooth or not smooth their surfaces are. Then comes the staple: what for metal it is made of, how long it is, how thick, its conicity. And the thread, with his dampening effect. And the more thread, the more dampening. Then, once those waves have reached the oboe, how the shape of the oboe affects their propagation... At the moment I'll stay by the reed. You might think that I'm telling nonsense if you have always thought about how reeds work following the theory of the traditional acoustics. To help you change your mind, in the next picture I've drawn an especial cut I made to some bassoon, clarinet and saxophone reeds: the bottom of the reed is usually cut in a straight angle to the blade. I turned that angle of 90 degrees into 45. The result was always the same: the sound became much brighter, the articulation much clearer and it felt as if you had to use less air pressure. The point is that such cut in such place following the traditional acoustics should have no effect at all in how the reed reacts or sounds. But it does have effects, and big ones. That is so because mechanical waves, coming down the reed, if its end is cut at 90 degrees will be mostly reflected back when encountering that surface, staying longer in the reed. Instead, when that surface was cut to 45 degrees most of the waves got directly refracted into the crook of the bassoon or the mouthpiece of the saxophone or clarinet. The playing qualities of these reeds are far superior to, and easily distinguished from, those of the long-stapled reed. 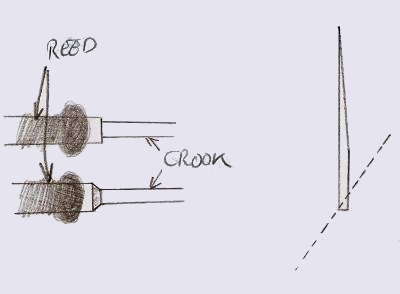 Above all, the Diderot reed does not squeak, one of the most annoying problems associated with the long-stapled reed. Expressivity no longer need be tempered by the terror of squeak. The Diderot reed also has a wider dynamic range, and its disarmingly soft low register is particularly impressive. The tone quality is generally more robust, if sometimes less focused, than that of the long-stapleg reed. The Diderot as well as other short-stapled reeds also solve another frustration encountered when one uses the long-stapled reed. I have often wondered why so many baroque oboes have an identical defect, i.e. an unreliable middle D, D# and E; in fact, there are original instruments on which these notes will not respond at all when played with this reed. It is inconceivable that instrument-makers throughout Europe all made exactly the same mistake, especially one of such magnitude. Far more likely the long-stapled reed is the culprit, a contention supported by the fact that the reeds I have described play these notes securely, with no risk of squeaks." Nora Post, in "The 17th-Century Oboe Reed"
Unfortunately I've not heard that particularly impressive and disarmingly soft low register: I've seen no one playing with a Diderot reed. But the more robust tone quality, if sometimes less focused than playing with other kinds of bridge I do have heard from my viola set up with a Stradivari model of bridge. Though I would say a much wider sound rather than less focused. Why do I speak now in this reeds page about my viola? Because the Stradivari models of bridge and the Diderot reed have something in common: the waves reach the instrument by the short way, conserving most of their strength or intensity. Remember the five surfaces that waves must get refracted into in the two-staples setting before they reach the oboe? With the Diderot reed it is only two or maybe three: cane – to one layer of thread – to wood, with a possible – to metal – somewhere in between for a certain sort of staple. I say maybe three because, despite what Nora Post points out from the Diderot Enciclopédie about this kind of reed having a brass staple over the thread, she once said in a letter to an acoustician named Arthur H. Benade (letter which I unfortunately no longer have, if somebody should have it, please mail it to me) that brass staple, or a staple made of another metal, or no staple at all made no difference. From that letter I understood that that staple was only to help the bottom of the reed hold a round shape in order to fit the bore of the instrument, so it is not clear to me where she did place that staple when she made such reeds. This is a rough sketch of a baroque reed I once got from Matthew Peaceman, an American oboe player who unfortunately already passed away at a too young age. He was the one who let me know about Nora Post's research about old oboe reeds. 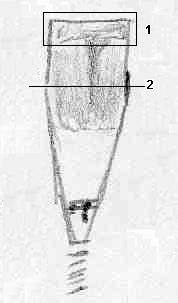 Some may argue that this is an American modern oboe reed, because of the windows of the scrape. Well, I disagree. It is far too wide to be a modern reed if we take its proportions for real. And we would be missing the cork cilinder around the staple beneath the reed. Instead, due to its proportions it looks very much to me as one of the reeds Nora Post talks about in her 17th-century oboe reeds article. Thinking of the waves coming down the cane from the vibration of the tip of the reed, I find the scrape of this reed very interesting. I've marked two areas on the sketch. 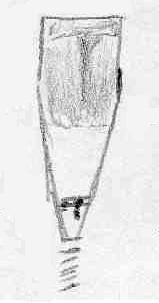 Next to it there are two drawings, an aproximation of the shape the scrape there could have. Don't take my drawings too literally, take just the idea because angles and thicknesses... they are just drawings!